I take a lot of dumb pictures when I’m drunk. Look at those guns though. 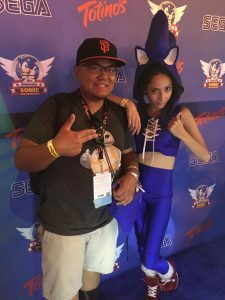 Sega celebrated Sonic the Hedgehog‘s 25th anniversary on Friday night with a paid party at the House of Blues in San Diego amidst all the Comic-Con craziness, so we decided to celebrate with them. Because I was checking out a few panels at San Diego Comic-Con, I was a little late, but that’s something you expect at all these SDCC after parties. People rarely arrive early, much less on time. I ended up getting there at around 6:45 PM when the party started at 6:00 PM, mainly because I didn’t think the venue would be more than a mile away from the convention center. I took a picture with her because I thought she was cute. Upon arriving, what was more surprising was the fact that the line to get in wrapped around three sides of the building. 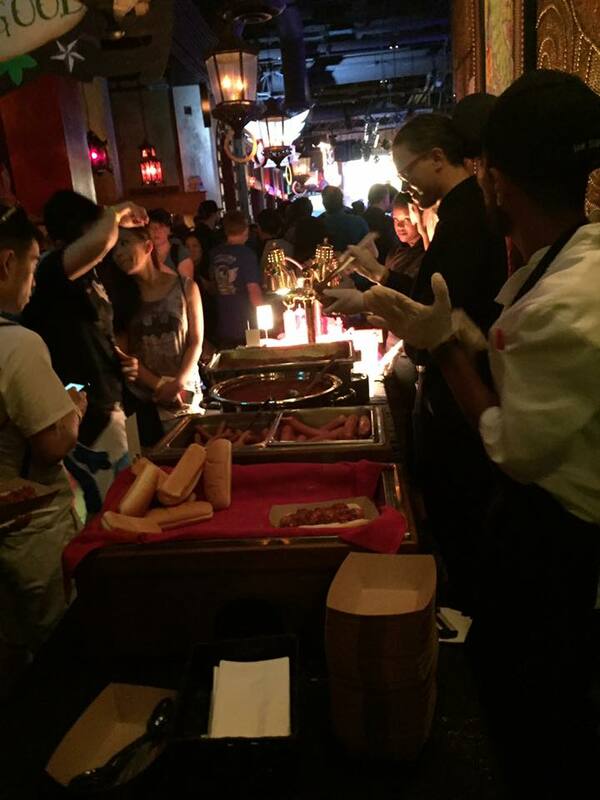 While long lines are nothing new Comic-Con, I thought the fact that it was $30 would make it more of an intimate party. And before anybody asks, yes, I did pay to get in. Sega promised food and a goodie bag, so I figured I’d pay for the trouble. After what seemed like a couple of hours, we got in. They patted me down, did a bag check, and then they made me pour out the water from my Hydro Flask. That aside, I was okay. 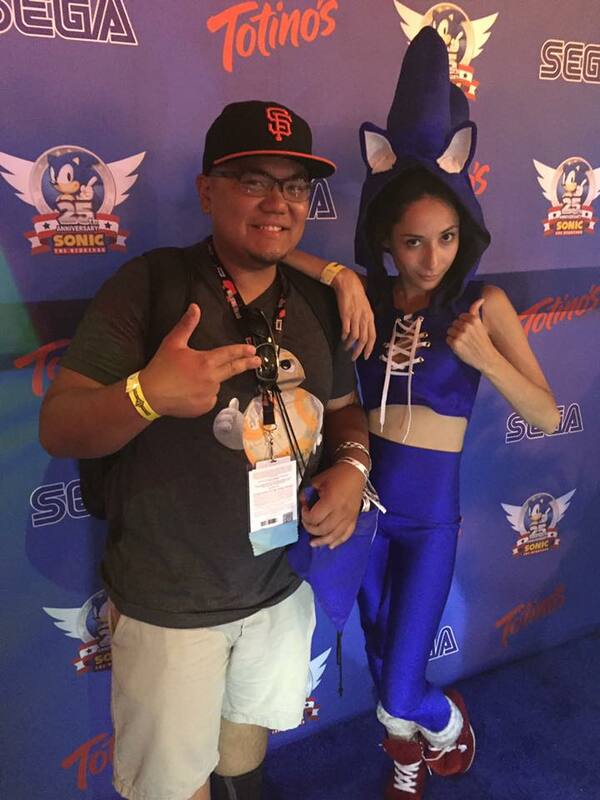 The bad, Hyper Potions, was already playing and as I was checking my Twitter, it also turned out that I missed the Sonic Mania announcement, which was okay because there were playable demo stations in one of the rooms (which we’ll have impressions on later), in addition to different photo ops with backgrounds and various encased collectibles as well as people in Sonic cosplay. 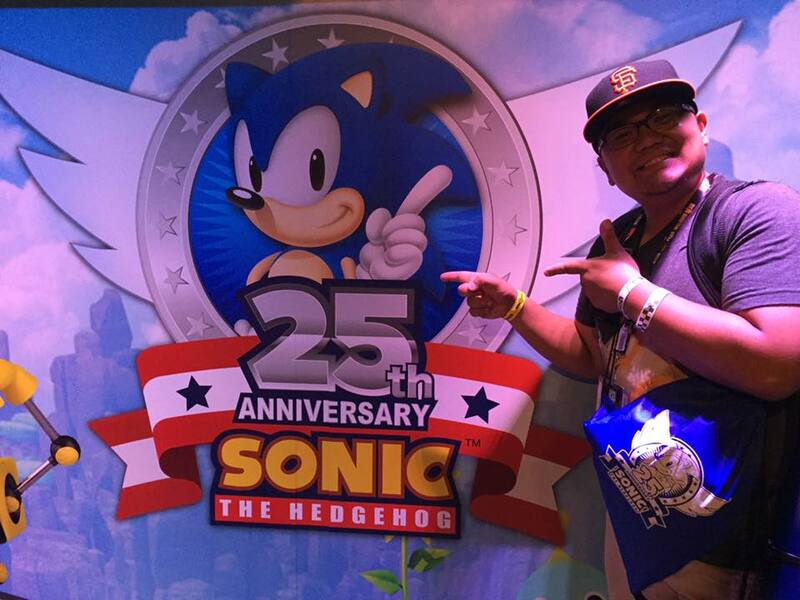 As for what we ended up getting, we got two drink tickets (yes, just two), the grab bag, and unlimited Totino’s pizza rolls (they helped sponsor the event) and chili dogs–I guess because they’re Sonic’s favorite food. There were sliders too. In line for chili dogs and sliders. None of the food was fantastic, but when it’s a super hot day and you just took double shots of 1800 tequila, you’re not really looking for quality. The House of Blues patio had another bar where I bought a round of “AdiosMotherFuckers” (or AMF’s) for the people I met in line, and there was an awesome blue Honda Civic with Sonic and the 25th anniversary logo on it. Even cooler was the fact that there was a TV in the trunk for people to play the original Sonic the Hedgehog on. I watched a lot of people die in Green Hill Zone, which was pretty awesome. The House of Blues fits can house a bit of people for a party. 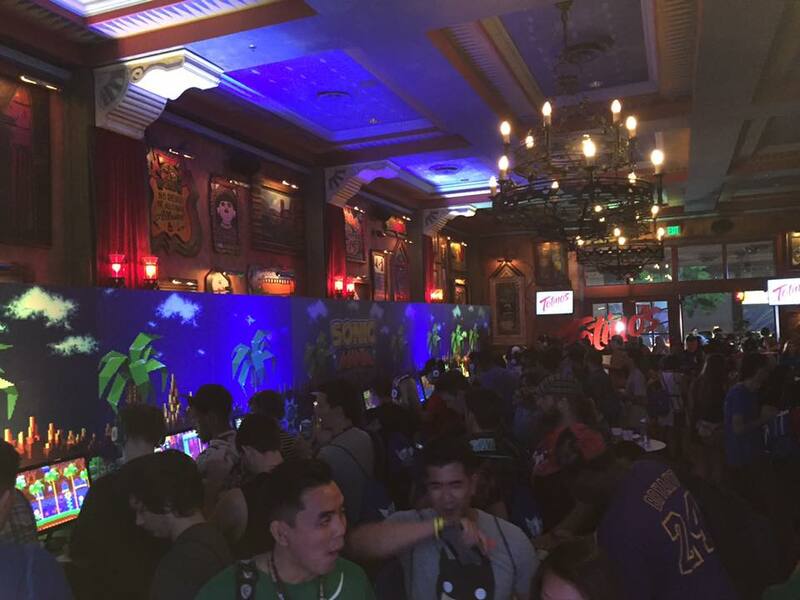 And yes, there’s people playing Sonic Mania. But what about the party? The music was mostly the heavy metal stuff that’s infested the games since Sonic Adventure. It’s not really my cup of tea, but I really appreciated them sticking to the theme. The last thing they did that night was unveil Project Sonic 2017. Nobody knows what it is. If I were to take a guess, I’d say it was the successor to Sonic Generations. 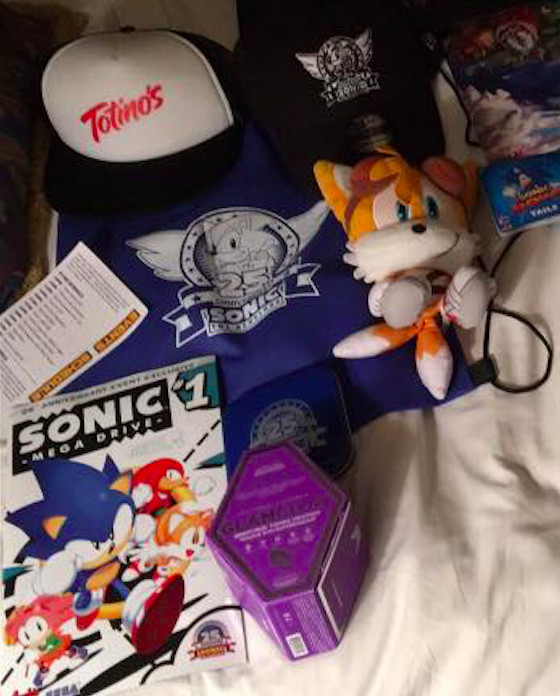 The goodie bag included the bag itself of course, a Sonic comic book, a Tails plushie, a 25h Anniversary Sonic medallion, a 25th Anniversary New Era baseball cap, and Genesis-themed 2GB USB thumb drive, a Totino’s snapback, and makeup. I don’t know why it had makeup. Anyway, it was a pretty cool event, and I’d say the $30 is well worth the price of admission when you consider how much drinks typically are at the club, in addition to what you’ll probably be able to sell the contents of the goodie bag for on eBay. It was definitely a good time though. I guess it was a better event to be at in person than it was to watch online. The livestream was a complete mess.